Jaffe says he's confused about why people would criticize his preference for making Sony exclusives over multiplatform titles. Whatever your opinion of David Jaffe, few would try to argue that he's not a very open man, or one to keep his opinions to himself. Unfortunately, this candidness seems to have rubbed a few people up the wrong way, as a number of internet pundits took exception to his comments about his working relationship with Sony. During an impromptu Q&A session on his Twitter feed, Jaffe was asked if the new Twisted Metal game would be coming to the Xbox 360 as well as the PS3. In his reply, Jaffe said that he and everyone at his studio, Eat Sleep Play, loved other platforms, but he found greater satisfaction in improving the value of the PlayStation 3 than casting his net a little further out. 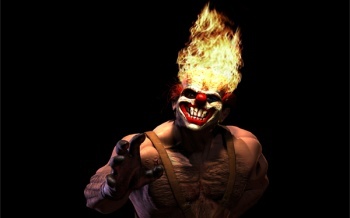 He also pointed out that Twisted Metal was a Sony owned IP, so the game was just for PS3 owners. This got reported on various places around the internet, but the comments on Destructoid were especially unkind, suggesting that he was a fool for not making multiplatform games. Jaffe responded to this criticism with exasperation, saying that he would love to have his games in every home and on every system, but he also valued his working relationship with Sony a great deal. He said that Sony provided Eat Sleep Play with a great deal of creative, marketing and business support, and that the people there were like family. He expressed amazement at the idea that people thought he might want to give that support up to go multiplatform. Jaffe's spent the last fifteen years working exclusively on games for the various PlayStations, including the incredibly popular God of War series, so it's not like he's ever been particularly secretive about his preference for Sony platforms. The criticism that people leveled at Jaffe, that he was throwing money away by sticking with a single platform, is overly simplistic and far from being the universal truth that his detractors seem to think it is. There's a lot more to a game's success than just shoving it out on every platform going. Multiplatform games cost more to develop, market and distribute, and while a game might sell more copies with a wider audience, a large percentage of those sales will go towards covering the increased expenditure. If Jaffe has a good thing going with Sony, and from his comments it sounds like he does, throwing it away for a chance of possibly making more money with a multiplatform release doesn't sound like a particularly smart move on Jaffe's part.